Bree went to the vet on Thursday and look what we saw. Yes, indeed, those black blobs in the ultrasound are puppies. 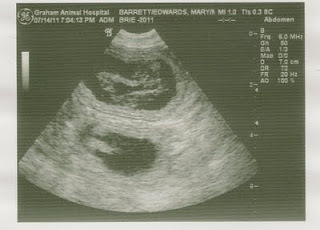 We use ultrasound to determine if a dog is pregnant and sure enough she is. While this test can't really predict how many puppies are in there (nor can it predict the gender of the puppies), we did see more than five little black blobs bouncing around. At this point, we're guessing there are around seven puppies, but we won't really know until they show up, somewhere around the 3rd week in August.